Thinking of ordering takeout? I’d be willing to bet that Chinese food is near the top of your list. It’s no wonder—the sauces are loaded with flavor and the dishes are oh-so-crave-worthy. Unfortunately, these mouthwatering mains also come packed with fat and calories, and often more sodium than you should consume in a full day. But don’t toss those chopsticks just yet! You can still enjoy every bite—with a few simple tweaks to your order. Whenever possible, opt for steamed dishes with chicken, shrimp or tofu, plus extra veggies. Ask for the sauce on the side and drizzle on just a couple of tablespoons worth. And when it comes to the rice, go easy and stick with (preferably) brown versus white or fried. 1. First, skip the fried egg rolls dipped in duck sauce and go for steamed vegetable dumplings with a touch of reduced-sodium soy sauce. Remember, steamed beats fried any day of the week. 2. Trade in the orange (crispy) beef or sweet and sour pork with house-fried rice for beef or chicken and broccoli with brown rice. An order of beef and broccoli is at least half comprised of vegetables so you’ll get plenty of nutrition and a hit of fiber (plus, you’ll save up to 1,000 calories). 3. Instead of Sichuan shrimp or shrimp in garlic sauce, which clock in at 700 calories each (the equivalent of 16 fried chicken nuggets or 44 tater tots! ), try shrimp with lobster sauce to cut 300 calories. 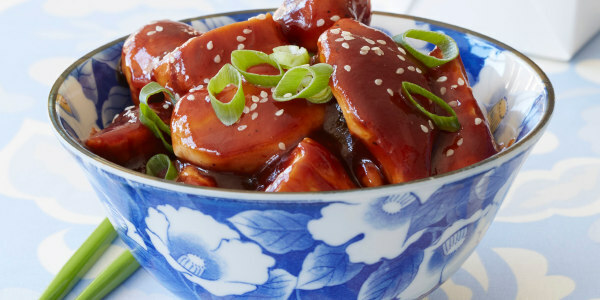 If you’re like most Americans, General Tso’s Chicken is one of your go-to dishes. Unfortunately, it's also one of the worst offenders when it comes to fat, sugar and calories, and sodium. But don't give it up! You just need to try my lightened-up version, which comes straight from the pages of my new cookbook,"From Junk Food to Joy Food." Drop that takeout menu and play chef tonight!